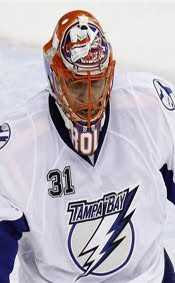 To start 2011, the Tampa Bay Lightning acquired Dwayne Roloson from the New York Islanders via a trade. During his first game, Roloson had that "just traded" look on his face. But it wasn't in his eyes, it was literally sitting on his face. While the team had issued him a new jersey and new breezers, Roloson's mask and pads were hold overs from the 2010 he spent in New York. This is a fairly common phenomenon among the brethren of recently traded goaltenders. A recently acquired netminder has to wait a while for his custom equipment to not only be made, but broken in as well. And don't be fooled. Goalies are particular about their equipment. A poorly fitting mask can be incredibly frustrating, especially during a bad game. And while I don't usually talk about equipment in these postings, the goalie mask is more than that. It's unique and artistic. A goalie mask design can be team-based or personal. It provides an artistic expression that isn't generally seen in-game in the other major sports. It can incorporate vibrant illustration or crisp eye-catching graphics. That said, there are some truly memorable masks that I remember. Chris Osgood and Dominik Hasek went old school. Patrick Roy featured an illustrative version of an avalanche. 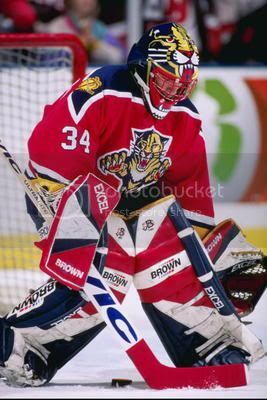 Bu the most memorable mask always belonged to John Vanbiesbrouck. The panther's head from the team logo dominated the shell, with the teeth cropping the the full cage from which The Beezer saw. That mask had it all: crisp graphics and a revolutionary concept. Back to Roloson: he eventually got a plain white mask, which he used until his new mask came in. I have to say, it's pretty cool. The steely wings are rendered beautifully and the one-color redux of the Lightning's alternate logo is spectacular. But Roloson isn't the only goalie with a great mask. In fact, there are a number of masks with enticing graphics and great references this year. One of Devan Dubnyk masks features a cartoon giraffe on the back, while Martin Brodeur still rocks his signature red and white flames. Thomas Vokoun's headgear shows off a leaping panther that would look at home within the team's logo set. Curtis McElhinney's goes for intimidation with his scary skeleton zombie duck, while Anaheim's other goalie, Jonas Hiller, opts for the minimalist approach. But the best mask of the year has to be Kari Lehtonen's. I'm obligated to say this, of course, as the consequences for not doing so include a vicious roundhouse to the head. But in all seriousness, what goalie wouldn't want to wear a mask with Chuck Norris on it. Cristobal Huet featured a wraparound design that mimics a Native American headdress last season. And Niklas Backstrom accented the natural shape of of his mask by added a paw clawing through it in the 2009-10 season. Robert Luongo has a strong history of good mask designs. He has played with multiple elements of the Canucks identity, including the team's classic V pattern, the rink logo, and even Johnny Canuck. Luongo's Olympic mask played on the lumberjack idea with an illustrated lumberjack. I am a big fan of the subtle aged texture Luongo incorporates as some of the backgrounds on his headgear. This week's design stays in the college football world. 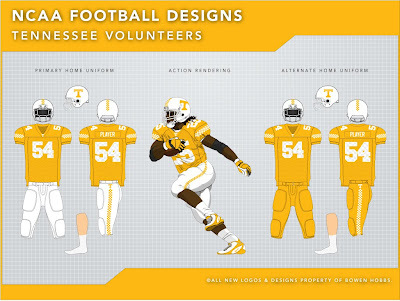 I have always enjoyed the Tennessee Volunteers' color palette of bright orange and white. But the uniforms themselves are pretty basic. 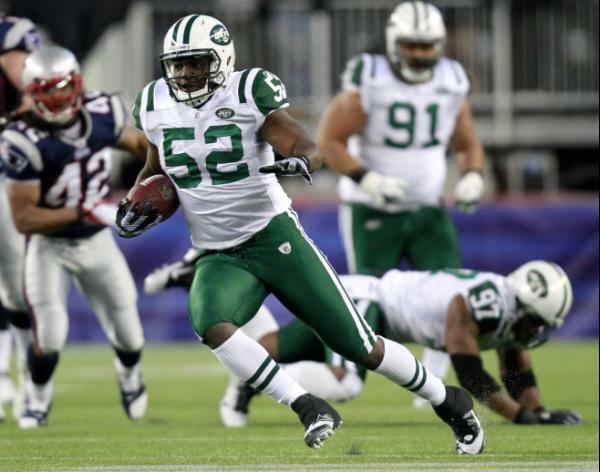 Furthermore, the helmet striping doesn't match the pant striping, while the jerseys have no stripes. (They tried matching the striping for one year in the early 2000s, but went back to their current/previous uniforms…) On the away uniforms the numbers have a black outline, while nothing else does. Needless to say, the Vols could use a lesson in consistency. My concept draws inspiration one of my favorite parts of Tennessee football: their checkerboard endzones. More on that later. The logo set starts with the Vols' iconic T. In addition, black has been completely removed from the identity package (except for one set of number, but I'll get to that). 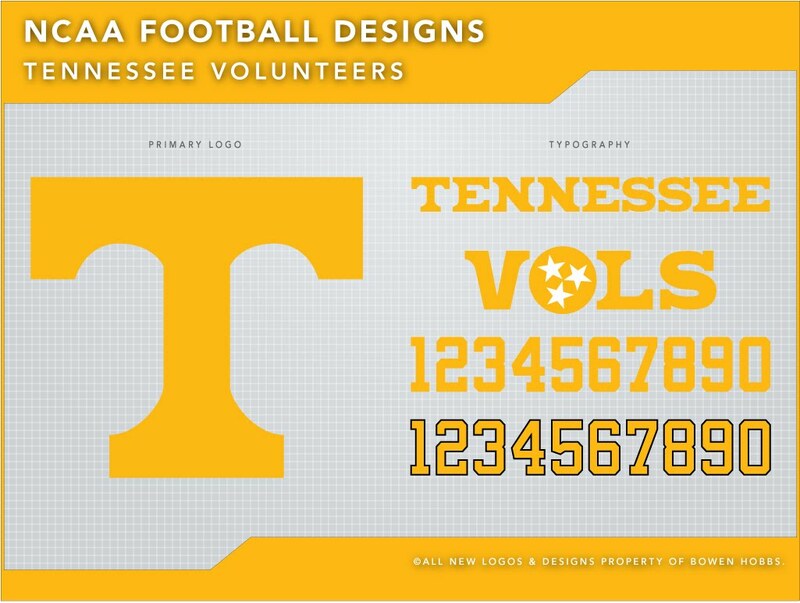 The TENNESSEE and VOLS wordmark were developed from the proportions of the T logo, giving the type a uniquely Vols feel. The O in VOLS pays homage to the Tennessee flag. 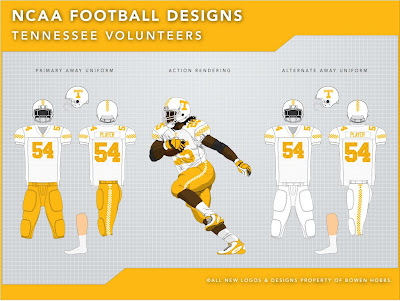 Back to the uniforms, I made use of the checkerboard pattern on the sleeves, as well as the pant and helmet stripes. In addition, a sublimated checkerboard pattern appears on the front and back numbers. (It's easier to see enlarged; just click on the image to do so.) I added orange pants, which are the primary option for the away uniforms in order to draw more distinction between the Vols and Texas. 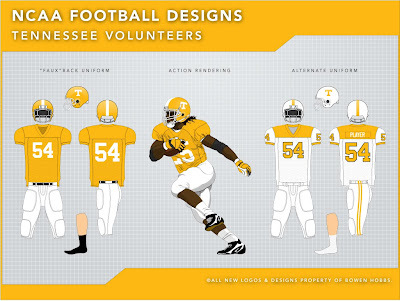 Since Tennessee has no third color, I decided to create two fauxback uniforms. 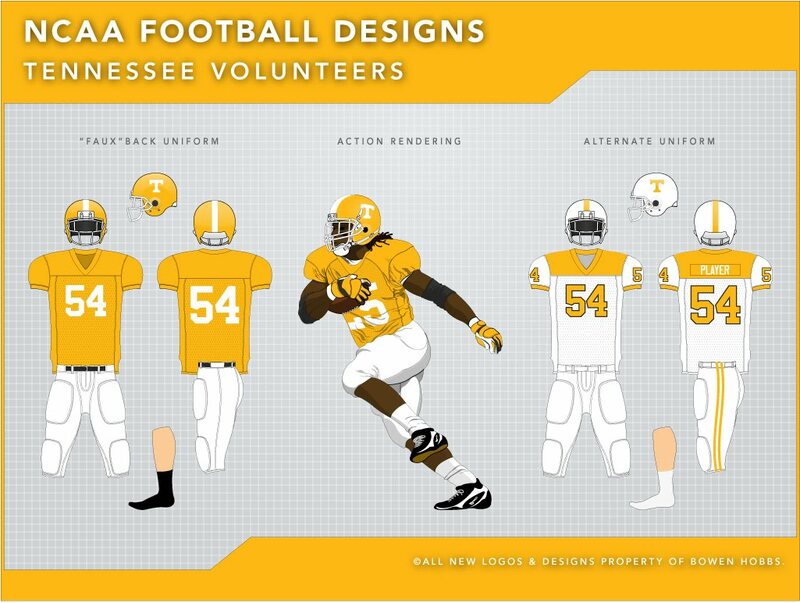 The first is a nod to the 1947 team, complete with orange helmets and contrasting black belt. The second honors the 1971 team, which the Vols did in 2004. The throwbacks contain black because their aesthetic is based more accuracy, meaning certain details do not match because they didn't in the past. Items like facemasks and shoes were seen as equipment, and weren't designed in the multitude of colors they are now. Feel free to leave a comment on goalie masks, the Tennessee Volunteers design above, or anything sports branding related. Thanks to all who have commented as well. So if need Boys Hockey Uniforms? I would recommend to visit my site, and our expert designer are willing to assist you what ever you need.